At end of the 1st Quarter, the Philippines was leading by 3, 22-25. In this quarter, biggest lead by Gilas went up to 10. And the lead went back to 10 during the 2nd Quarter after Ranidel de Ocampo made a 3-point shot at 7:16 of this quarter. 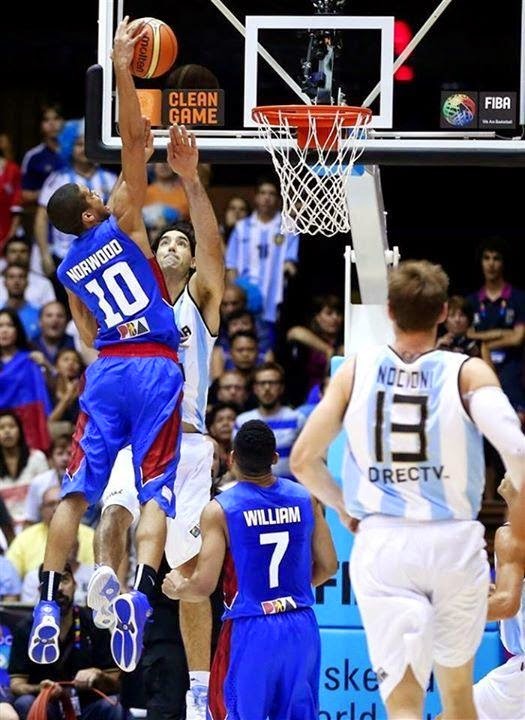 However, Argentina managed to overcome the deficit and started to lead at 1:17 of the 2nd Quarter. 38-36. And they even finished the 1st Half with a 5-point lead. 48-53. At halftime, it's Ranidel De Ocampo who's scored the most for Gilas, 10 pts, while Andray Blatche only has 6 pts. The Argentine team not slowing down in the 3rd Quarter. They recorded their biggest lead of FIFTEEN (15) with 1:30 minutes left. 68-53. 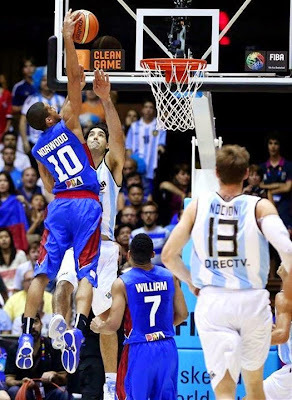 3rd Quarter over with Argentina still ahead. 71-61. Our Jimmy Alapag drew the biggest cheers from Pinoys around the globe for making triple 3s in the 4th Quarter, partly to be thanked for the Gilas to come so close to Argentina in the scoring. With 2:09 minutes remaning, they're trailing behind just by 1 point, 82-81, after Alapag made his 3rd 3-point shot in the quarter. But game ended still in favor of Argentina. 85-81. Sad. Philippines lost 3 games already, and remains in the bottom of Group B. Top performers for Greece were Marcos Mata (17 points, 9 rebounds, 1 assist) and Luis Scola (19 pts, 7 rebs, 4 assts, 1 stl) while it's Andray Blatche (14 pts, 15 rebs, 2 stls, 2 blks), Ranidel de Ocampo (18 pts, 5 rebs, 1 asst) and Jimmy Alapag (15 pts, 1 reb, 2 asst) for Gilas. It's Blatche's 3rd straight double-double, and his rebounds of 15 is the team's highest so far. At this point, he's now the top rebounder in the whole tournament. Still, it was quite a big achievement for Gilas. Imagine, they played against Argentina, the 3rd-ranked team? And the game turned out so tight? After this game, Argentina has improved to 2-1 in Group B team standings, while the Philippines is still winless at 0-3.